The SR-40 was introduced mid of 1976 together with the entry calculator TI-30 and the financial calculator Business Analyst. These three calculators defined a new manufacturing approach within Texas Instruments. Everything is snapped together, not a single screw is used within the whole calculator. Compared with the earlier SR-50A or SR-16-II and even the failed SR-40 Prototype calculators, the electronics was squeezed dramatically. The preceding calculators used a main printed circuit board (PCB) and a small daughter board carrying the display. The SR-40 and all other (except the SR-51-II and TI-45) calculators in the Majestic-line used a LED-stick carrying the whole electronics! If you open such a calculator you'll find the LED-stick, one resistor and one integrated circuit in a 28 pin housing. That's all. If you are interested in the calculating accuracy of scientific calculators don't miss the Calculator forensics. • The LED chips were furnished by the SC Group in Dallas. • The lens by an Ohio supplier. • The circuit board and the IC are from TI Singapore. • The board assembly was by TI Taiwan. • and assembled to the board in the Lubbock or Abilene plant. The entry line uses a 9-digit LED-stick giving either 8 digits display in normal mode or 5+2 digits in scientific mode. The calculators uses ON/OFF keys. The upper line uses a 12-digit LED-stick giving either 8 or 10 digits in normal mode and 8+2 digits in scientific mode. The calculators use an ON/OFF slider. The usage of these modern calculators was easy, Texas Instruments invented with the SR-52 the AOS entry that allowed up to three pending operations within the parantheses. Later in production the metallized TI logo was replaced with an unmetallized. View here the SR-40 w/o chrome. 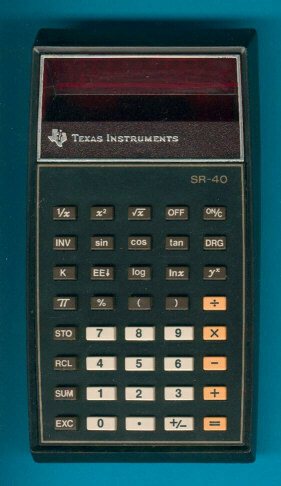 The SR-40 is featured in the Texas Instruments Incorporated bulletin CL-217A dated 1977.